Size: 11 x 6 x 4.5cm/4.33 x 2.36 x 1.77"
【5 LIGHTING MODES】The bike headlight has 5 different lightings.3 brightness modes and 2 flash modes with sensitive button (Strong/Middle/Low/Fast Flash/Slow Flash). Meet your needs at night. 【5 HORN SOUNDS】The bike front horn light with loud sound up to 130db, can be heard from a far distance. It has 5 different sound types, press the horn switch for 2 to 3 seconds to change sounds. And it'll make a different sound, then let up off the button, if you don't like the new sound,repeat. Notifying all traffic in your way to move aside. 【FAST CHARGING】Bike headlight can be charged with USB cable(included),simply connect your bike light to USB port via USB cable, automatic power-off when fully charged. 【EASY TO INSTALL】Comes with a handlebar rubber mount, attach and detach from bike easily without tools. The built-in strap is adjustable and suitable for most bike handlebars. Easy to install and remove from the bike to charge. 【EASY TO INSTALL AND SAFETY NIGHT RIDING 】Bike lamp Get ready to take on the night streets with this perfect front bike light and horn set. 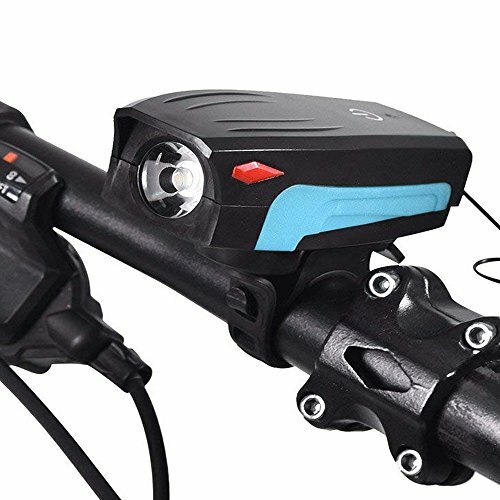 This high quality, waterproof, and extra durable front bike light will not only light up the night streets keeping you safe from unexpected pot-holes, debris, and any other unexpected hidden obstacles but the addition of the loud bike horn will add as a secondary notice to everyone on the streets of your presence. If you have any questions about this product by Onedayshop®, contact us by completing and submitting the form below. If you are looking for a specif part number, please include it with your message.